As you may recall, yesterday I created an avocado-based feast. I'm pleased to report that it was a perfect evening of dry wine, sparkling conversation and happy tums. As I made two avocado dishes (main and dessert), this post is part #1: the main event. 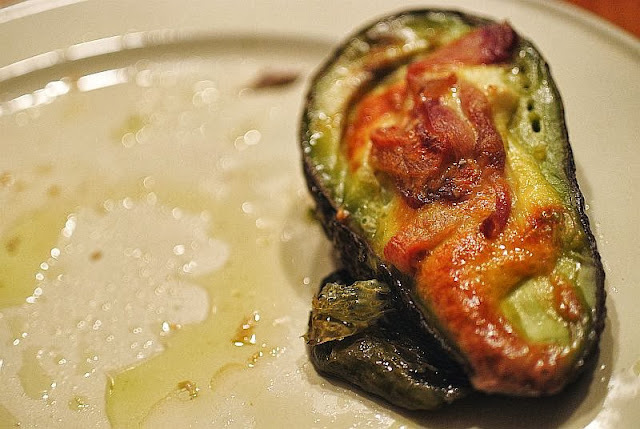 Bacon Wrapped, Cheese Stuffed Avocado. This really could not be easier. All that is required is cheese, streaky or shoulder bacon, and perfectly ripe, or even slightly hard, avocadoes. 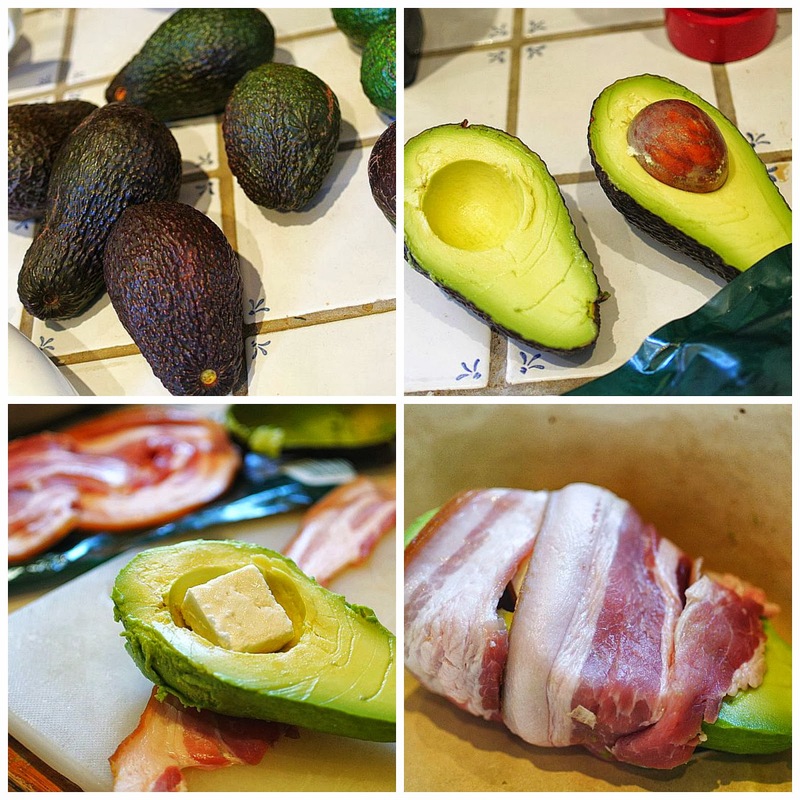 Just follow the steps in the collage below: obtain avo's, remove the stone, fill with feta, wrap with bacon. Bake for about 20 minutes at 180C, or until the bacon is crispy. 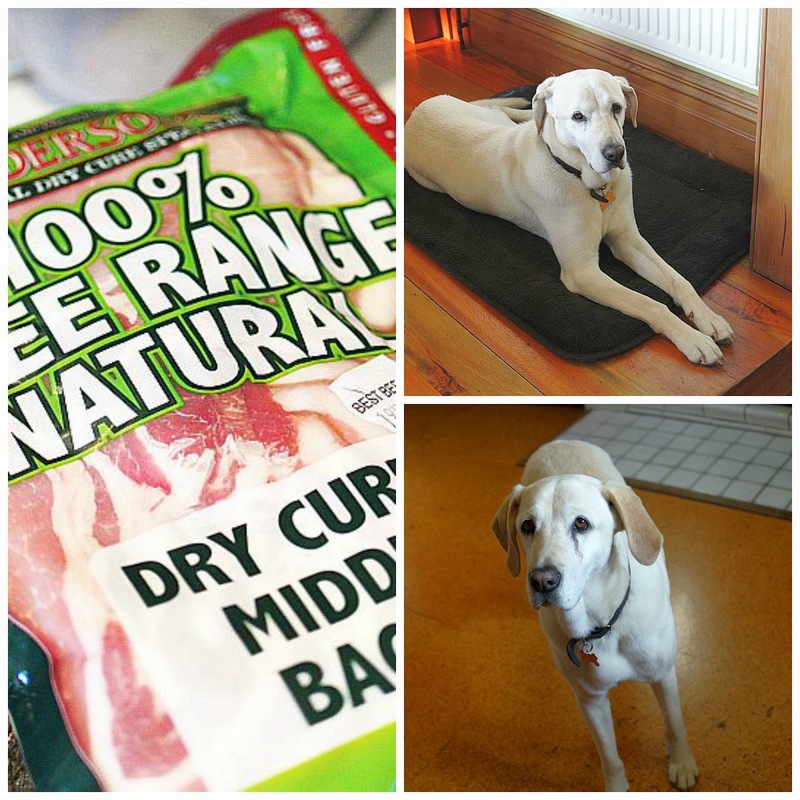 Speaking of bacon, when I opened the packet, this had a strange effect on my canine companion. Such soulful eyes. How could I say no? 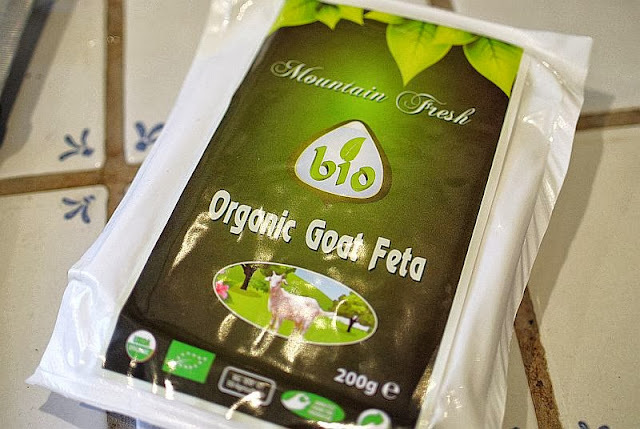 The cheese I used was goat's feta, a good strong flavour. 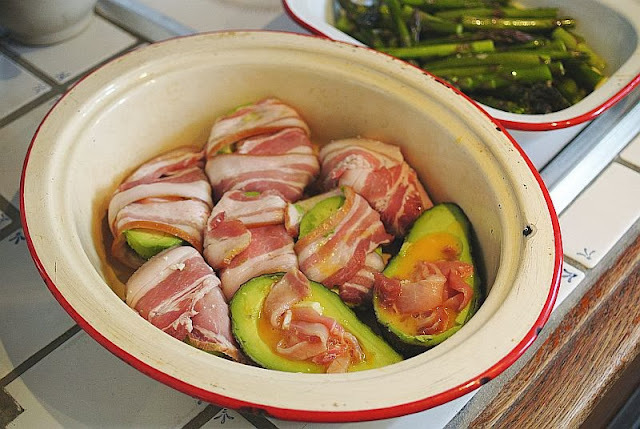 As I had more avocadoes than bacon, the last few were not wrapped, but instead stuffed with bacon and egg. These made breakfast this morning. 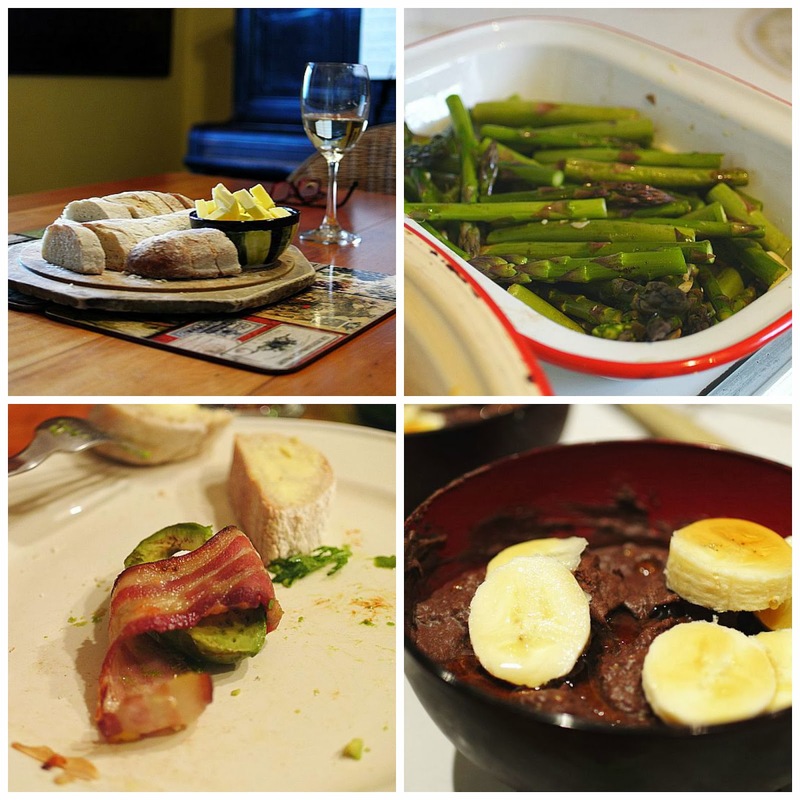 The meal was served with crusty bread, white wine, salad and garlic asparagus. 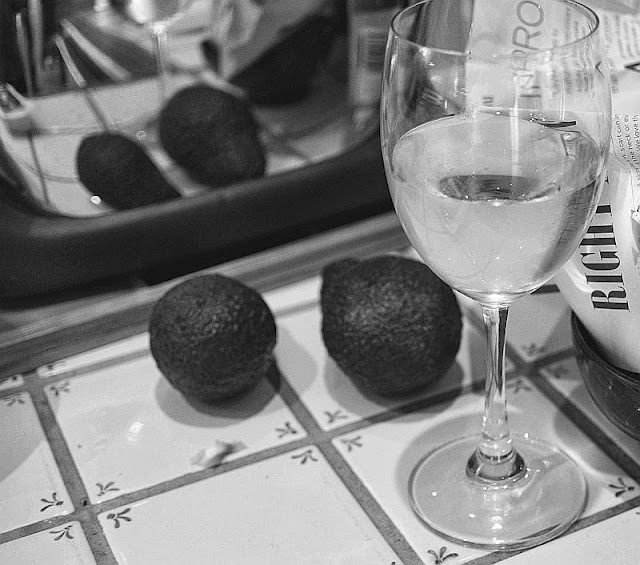 The chocolate avocado mousse was almost too much after such a rich meal, but we managed it, then lay around like beached whales, lamenting a lack of self-control. Sounds like the perfect meal to me. Except all that avocado might give me a tummy ache...Meh, it would almost be worth it. I did think of that. As I replied to Elizabeth, I think you could reduce the avocado a lot and still get the effect. It was a lot of avocado. We basically ate two whole avocadoes each. Don't even want to consider how many calories that is! Have never cooked avocado. How did that turn out? Totally yum or a little odd? Must try this. It didn't change much when it cooked - was just like a hot version of an avocado. 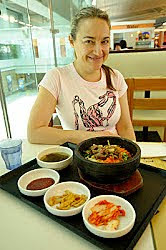 The main problem is that the whole thing was very rich - lots of fat. I think next time I will reduce the avo portion. Probably, cut it into quarters instead of halves. I just read that 'recipe' out to Stew... he said it sound lovely! He loves avocado.